Sustainable construction is about more than just carbon and energy. Biodiverse buildings and cities contribute to abundant, healthier and happier sustainable environments. With increased emphasis on sustainability within the recent planning policy reforms, the issue of integrating the needs of biodiversity including bats into the built environment is an important one for many professionals in the construction industry. 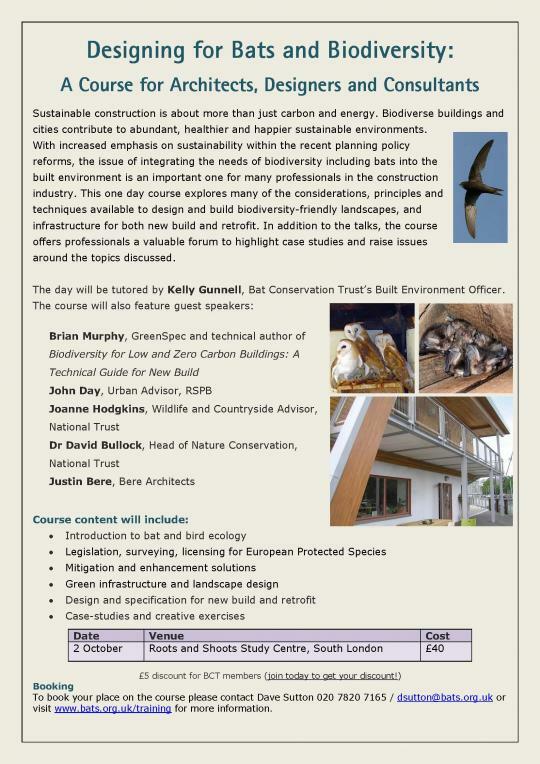 This one day course explores many of the considerations, principles and techniques available to design and build biodiversity-friendly landscapes and infrastructure for both new build and retrofit. In addition to the talks, the course offers professionals a valuable forum to highlight case studies and raise issues around the topics discussed. The day will be tutored by Kelly Gunnell, Bat Conservation Trust’s Built Environment Officer, who will discussing bat ecology, legislation and design requirement. John Day from the RSPB will be discussing the ecology and design requirements in relation to birds. Justin Bere will be presenting the architect's view on designing for biodiversity with specific reference to his experience in designing his own house, the Muse and retrofitting the Mayville Community Centre, incorporating green roofs and bird and bat boxes in particular. Brian Murphy of GreenSpec and technical author of 'Biodiversity for Low and Zero Carbon Buildings: A Technical Guide for New Build' will be explaining how to specify for biodiversity. Stacey Waring will be presenting on Breathable Roofing Membranes in relation to green roof design. Cost for the day, including lunch is £40.